Kenmore Electric Range Model 790.92703014 Oven is not heating but stove top and controls work. The oven is not heating up. The temp shows 100. The fan is spinning in the oven. Light in oven works. But no heat. When I hit the broil button - same thing. No heat. There is only one heating element in the oven - at the top. The stove works. The clock works. I took out the element. It looks like new. I hooked up a Sperry multimeter to the element and the sperry device buzzed w continuity. The connections to the element were tight and not melted or in poor condition. Should I check the thermometer next? Or do I need to know how much resistance in the element to double check that it's ok? If so I'm not sure how to check for that on my multimeter. Sperry DM-210A. The instructions for sperry are HORRIBLE. From what I have read - it sounds like it's probably the $200 control board. But I want to be sure before I buy it. Reset breaker if you haven’t. The real test is live voltage tests at board to see if it’s sending voltage when it should. But I don’t recommend that based on your level of experience. Board likely at fault. Buy it here and it’s returnable. you also need to replace overlay. Thanks for the quick reply. I don't know what to tell you 16345Ed but there is only one element in there. Not 2. I'm happy to hear the board is returnable and so will try that option. Also I had checked the breaker but did not reset it. I'll try that first and let you know. Or maybe it’s the broil one if there is a broiler drawer at bottom of unit. Hidden element. Whoa. I'm not worthy. Sensai - I put back the upper element and reset the breaker. No luck. I am trying to remove the bottom cover that is hiding the bottom element - the one screw comes out easy. The other is spinning but not coming loose. I am going to try a vice grip on it and give it a good pull. Unless you have another suggestion. I would like to see if that element is intact. Or do you think it might just be the control panel? Reminder - broiler alone does not work either. If it were me ,I would pull it out and take the back off and check for power at the element connections, cause if there is no power to the element you will have to check for power at the board anyways. 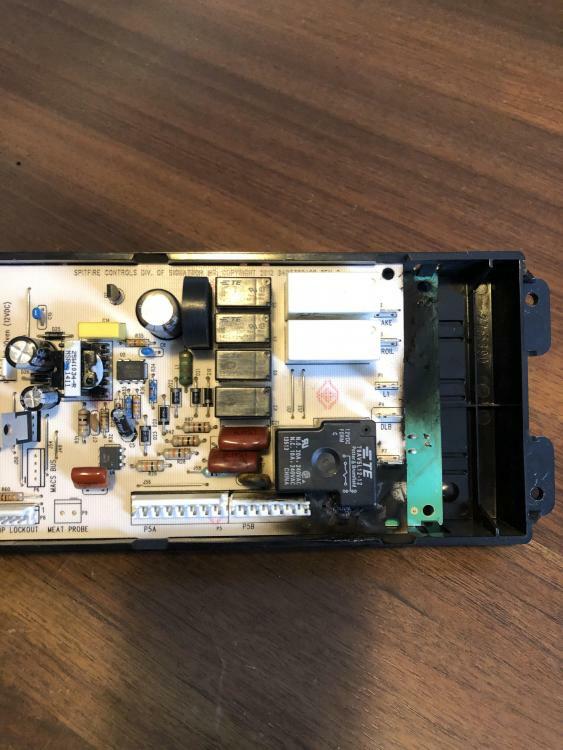 Evaappliance - Are you saying check the power at the element connections? Or did you change your mind and now suggesting the new board? If I test the power I have a Sperry DM-210A that has an instruction manual written in some martian language. So would love a suggestion on how to use. Bc Youtube vids are not descriptive enough either. Sweet truck. I suggest you order a board. 240volts can kill you if you don’t know what you are doing. Tx. Safety is no accident. Odds are with the broil not working either that 16345ed is exactly right and you will need a board. I just always verify no power to the elements just to be thorough ? Tx again. Double checking...earlier a post suggested I buy the "overlay" also. My clock and all lights seem to work. Is that really necessary? The overlay is glued to control, on a black control you can carefully pull the overlay off and re use it without it looking to bad , but if it is white it will work but look like crap. The clock & all other lights come with new control , Just a way for the company’s to sneak a little more profit !? I’ve also seen overlays, regardless of color, tear when peeling them off old clock/control. I wanted to thank both of you. It was really easy to replace the control. And I just used the brand new overlay because the old overlay was in bad shape after I pulled it off. The oven is working perfectly again. We made cheese sticks in your honor. Fantastic! Thanks for letting us know. I had the exact same model and it was the clock/electronic control. Instead of having a thermal cutoff like most self cleaning ranges, this just has a double line break relay that cuts off the line voltage to the bake and broil elements integrated in the clock. Totally stupid design.